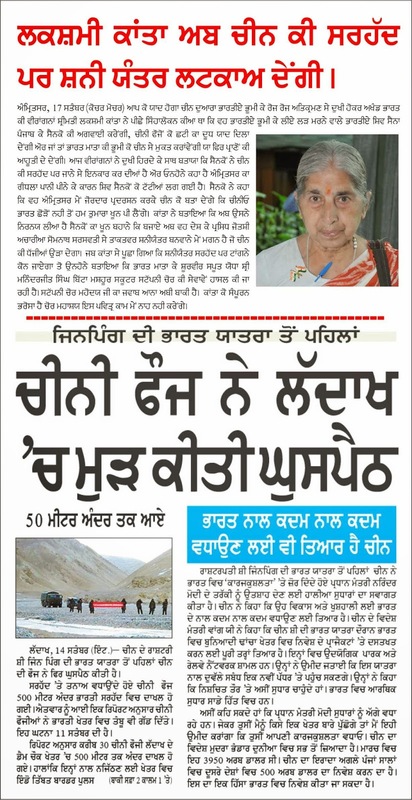 Amritsar, Sept. 17 (Kochar Mochar) Iron lady better known as the Virangna Bibi Luxmi Kanta Chawla who had sometimes ago announced that she would herself fight the Chinese army on border and leading Shiv Sena Punjab sainaks has withdrawn her feet from the announcement. She said that the Shiv Sainak have refused to head towards Chinese border. She said the brave sainaks have on the contrary announced that they would arrange a fierce demonstration before Hall Gate Amritsar. Kanta said she agrees that decision to hold demonstration is a more brave act. The sainaks threatened the Chinese army to vacate Indian territory or else they will quench their thirst by Chinese blood. Kanta said, "Why should we spill blood when we have our traditional weapons in our hands," She proudly declared, "We are going to install a Shani Yantar on the Indo-China border which will keep the Chinese army away from border." She informed that the famous astrologist Shri Som Nath Sarswati of Varanasi is preparing the Yantra and under his command 1001 pundits are participating in the yajna. When Kanta was asked as to who would install the Yantar, the bold bibi explained that services of the famous scooter stepney thief Maninderjit Singh ji Bitta are being commissioned. A meeting between India and China to end the 13-day-long stand-off at Chumar in southeastern Ladakh proved inconclusive today as both sides failed to agree on terms to de-escalate tension and pull back their respective soldiers from the area. Background diplomacy is, however, under way, sources said. China has hardened its stance and is in no mood to climb down from its objective of building a road south of “30-R” post. The two sides had agreed not to allow construction in disputed sections of the Line of Actual Control (LAC). India is opposed to the construction of the road, which falls in the disputed areas. Both sides have made serious backchannel talks to defuse tension along the LAC. Sources said India’s opinion was to have a gradual time-bound reduction in the number of troops to de-escalate the situation. But Beijing did not commit to the suggestion. Background meetings were, however, taking place to end the impasse. Under a mechanism available, both sides can pull back from stated positions without ceding ground to the other. The two sides will have to agree to a formula that seems workable for both. The Indian Army and the Indo-Tibetan Border Police (ITBP) have been asked to hold ground till the People’s Liberation Army of China withdraws. Minister of State for Home Affairs Kiren Rijiju today said India was firm on its position. Prime Minister Narendra Modi was likely to be briefed tomorrow. In New Delhi, Ministry of External Affairs spokesperson Syed Akbaruddin said the situation at the border was best handled by those positioned there. He said since the meeting between Modi and Chinese President Xi Jinping in New Delhi, “we (MEA) have been following up the issue and engaged at different levels and at different places. Quiet diplomacy is at work and we are addressing it expeditiously”.